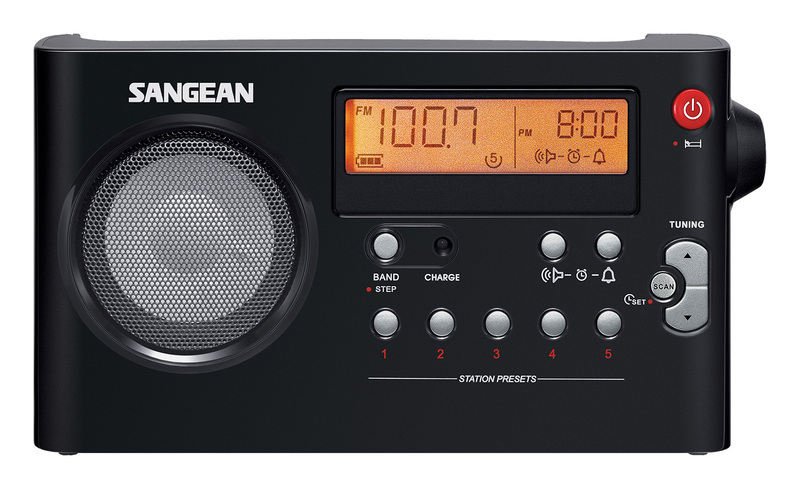 Description: The Sangean PR-D7 and PR-D14 have very little in common other than being somewhat close to each other in price. It is difficult to determine their suggested list prices, but while it is clear that the PR-D14 is the more upscale of these two siblings, their street prices somewhat overlap. 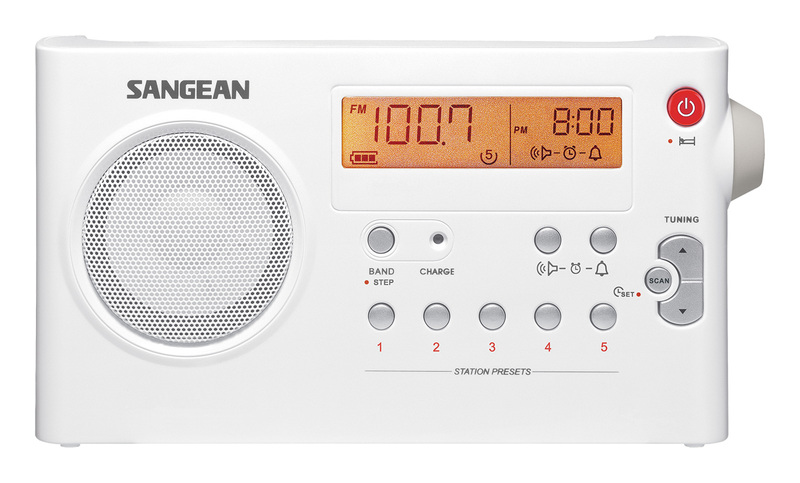 During the time when I was evaluating these radios the PR-D7 ranged from $49 to $76 depending on color choice (black or white) and place of purchase. During the same time the PR-D14 ranged from $66 to $79. Both are generally available near the lower end of these ranges so usually the PR-D7 will cost you a little less. The PR-D14 features DSP design while the PR-D7 is PLL digital, and the ‘14 has more features including FM Stereo at the headphone jack, FM RBDS, USB MP3/WMA Playback and an Aux input jack. The PR-D7 runs on 6 AA batteries while the PR-D14 uses 4 D cells. Finally the PR-D7 is more compact, measuring approximately 8 ½” x 4 ½” x 1 ½” while the PR-D14 measures approximately 9 1/3” x 6” x 2 ½”. Features in common include Illuminated Display, Clock with Humane Wake Alarm, Sleep Timer, Snooze, 10 Memory Presets, Auto Seek and the ability to internally charge NiMH batteries if desired with the supplied AC adapter. These adapters by the way are well-designed and don’t inject excess noise into your AM reception.. Performance Comparisons: It was very interesting putting these two radios side by side to see how the user experience differs between them. Other than the obvious feature differences here’s what I found. AM Reception: Here the PR-D14 was a slightly better performer. I tuned to several stations of varying strengths as well as several which illustrated various reception problems and found that the PR-D14 was a bit more sensitive earning a ranking of Four Stars in the AM Mega Shootout list where the PR-D7 rated Three Stars. There were a few signs of very slight DSP whines here and there on the PR-D14 but they were very mild and did not generally interfere with reception of tough signals. The PR-D7 sometimes had a bit more background hiss on medium and weaker signals but it was still very good. Remember that many locations have such high levels of RF Interference (RFI) that these differences would be masked. But on direct comparisons the PR-D14 did a better job of making weak, out of town signals sound just a bit stronger and clearer. Both radios demonstrated excellent selectivity and had no trouble separating my adjacent test signals from one another. Night time performance was also excellent on both with good AGC characteristics – their night time performance was typically closer than the daytime tests revealed. 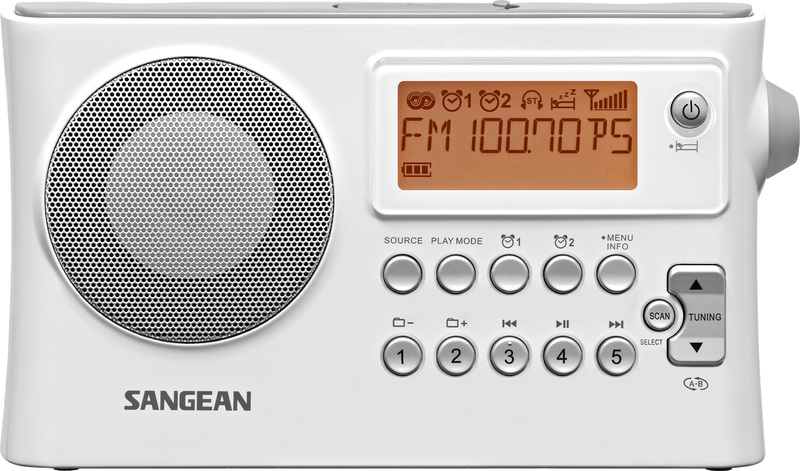 One negative – both radios mute while tuning and it takes a second or so to unmute after the frequency is changed so they are not ideal band scanners, but once tuned in their reception was very good. It’s interesting that while the PR-D7 is a PLL design and the PR-D14 is DSP, their muting characteristics seemed identical. Also note both are tuned with Up/Down buttons rather than a tuning knob…not a deal breaker for me but worthy of note. FM Reception: On FM the radios performed more similarly with both rating a superb Five Stars in the FM Mega List. I’ve pointed out before that comparing FM portables is tricky and this is a great case in point. For my tests I used a familiar Five Star radio as a reference. I used many test stations spanning the FM dial and posing different kinds of reception challenges. Some signals were very weak, some were interfered with by neighboring signals and some frequencies revealed two or even occasionally three stations which could be selected by moving the radios and re-orienting their antennas. The odd thing is that although all three of these radios performed similarly overall, there were particular stations which might be better on one radio or another. Tabulating my results, none of the three radios outscored the other two but on certain stations one might be better or worse than the others. This is a common occurrence and is due to the combination of many factors that contribute to determine final reception of problem signals. Very interesting, but both Sangeans were about as good as it gets for FM reception. Note the PR-D7 is mono whereas the PR-D14 will provide FM Stereo at the earphone jack. Sound Quality: Here the PR-D7 and PR-D14 were opposite ends of the spectrum. Neither has a tone control or variable bandwidth on AM so the sound they give you is what you get and there is no adjustment for it. The smaller PR-D7 sounds like the smaller radio that it is…not bad at all but favoring high frequencies more than lows. You could describe its sound as crisp and clear and for AM voice in particular it is very natural. The PD-D14 on the other had has a somewhat bigger sound but is rather mellow in the highs. It lacks the high frequency response and crispness of the PR-D7 but does have a warm sound, especially on FM. For perspective, both sound fine on their own but since they are so opposite one might appeal to you more than the other…I would bet in a poll of100 people the results might well be 50/50. I tend to favor the crisper AM of the PR-D7. By comparison the PR-D14 on AM sounded like the PR-D4W when that radio was set to its 2.0 KHz bandwidth. But on FM the PR-D14 is the winner with a fuller sound. In the final analysis I preferred the sound of the PR-D7 on AM and the PR-D14 on FM. The PR-D14 allows playback of MP3 and WMA files via a top mounted USB port. The display is a bit limited in this mode showing only folder and file numbers. While it does display the Artist and Title of the song while it is playing, there is no easy way to browse the folders and files to see what they are. It would be nice to be able to browse and organize the file names as I can with some other players. Also note the PR-D14 has an Aux in jack for connection of an external audio device and it will mix stereo inputs to mono. Conclusion: So, which should you pick? Well, if you are primarily an FM listener you may prefer the PR-D14 for its fuller sound quality, stereo via earbuds and RBDS info on the display. If you want to play music files from a USB stick or use an external audio source the PR-D14 is the one you need. For AM listeners the choice is more a matter of taste. The PR-D7 is a hair less sensitive on AM but has better audio clarity. It is also the more compact of the two if that is a consideration. Both are good performers in their category and I would say that at their relatively low cost you can’t go far wrong with either one.